But it was going at way more than 20mph which would be the maximum speed to pan up at that location. It was, but not the widely publicised 105mph. Closer to half that. There's also some contention over the speed the train was running at. Could an 802 have reached 105mph on diesel by the time it was at the incident location? Whether it could or not, it hadn’t reached 105mph. (Goodness only knows if I have got them right now - but at least I have planted a flag of caution for future readers! Due to damage to the overhead electric wires between London Paddington and Slough all lines are blocked. Train services running to and from these stations may be cancelled, delayed by up to 60 minutes or revised. Disruption is expected until 18:00 28/10. Due to damage to the overhead electric wires between London Paddington and Reading all lines are closed. Train services running to and from these stations may be cancelled, delayed or revised. Disruption is expected until the end of the day. 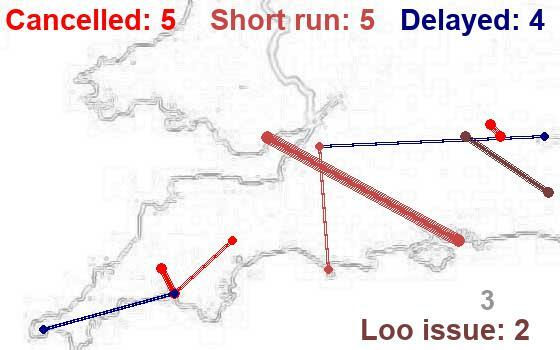 Since around 11:30am Sunday morning,virtually no train service has been able to operate between London Paddington and Reading in either direction owing to the damage to the overhead wires. This has led to widespread disruption with trains initially stranded in various. Reports of some passengers taking it upon themselves to operate emergency door releases and spilling out onto the track near Ladbroke Grove. Not going to help the situation that one option for those travelling to the SW today isn’t easily available in that Waterloo to Exeter services are starting/terminating at Basingstoke due to engineering work in the Woking area. My wife was due to travel home from London this afternoon but we’ve decided she is better off staying put and travel tomorrow. Someone reporting on uk Rail Forums that Waterloo is already busy with those arriving from Paddington. GWR now reporting signalling problems at Bristol Parkway now. For those who have to travel this afternoon I wish you all the best, it’s not looking good. Customers travelling to destinations in Devon and Cornwall are advised to travel via London Waterloo either to Reading or via Salisbury to interchange with West Country services at Exeter St Davids. Agree, though technically speaking you can but need to change at either Guildford for a bus or change at Reading for a train to Basingstoke by which time you are better off staying at Reading in the hope of a GWR service to the SW showing up. I'm supposed to be flying from London City this evening. I saw the disruption warning on the National Rail app and decided to catch a much earlier Taunton - Paddington train. Currently on the 13:15 Taunton to Paddington train and - so far - no announcement has been made about the disruption beyond Reading. Wishing you all the best Wilf19. Almost certain your train will terminate at Reading. Head over to the Platforms for the service to Waterloo. Let us know how it goes. 14:51 arriving 16:23 at Waterloo or 15:21 arriving 16:59. Or you could try 15:11 XC to Oxford, change to 15:41 Chiltern to Marylebone arriving at 16:51 if the SWR services are too packed - though they're both 10-cars which is good news. Thanks for the info, I'm ready to be quick off the mark at Reading. When I saw the issue I caught a train 2 hours earlier than I originally planned and - me being me - I had already allowed a lot of slack in case of problems. My flight isn't until 8pm so I should make it one way or another but that could be tempting fate! I really hope this isn’t the future of travelling in and out of Paddington that these two incidences last week and again today aren’t connected. Now I'd say that if these two incidents have a common cause, that's less of a problem - if the cause can be found and fixed. If there are two independent causes, that means two causes to find which must be harder. Of course the second one is probably a "normal" wire break, due to wear. That's worrying as condition monitoring ought to prevent it, but no doubt there's always a residual level of failures below which it will never go, and if this is one of those it's not a new thing to worry about.